For the painter, see Jacopo da Empoli. Empoli is a town in Tuscany, Italy, about 30 km southwest of Florence. It is 30 m above sea-level, to the south of the Arno. The plain of the town has been usable for agriculture since Roman times. Empoli is on the main railway line from Florence to Pisa and is well joined with the city of Siena. Empoli has a long tradition as an agricultural centre. It has given its name to a local kind of artichoke. Empoli was already settled in the time of the early Roman Empire, and still existed in the 4th century AD. The river near the city was a good route for the trade of agricultural products, together with the local amphorae. Since the 8th century Empoli grew as a town around the castle, known as Emporium or Empolis. In 1119 it was controlled by Guidi. In 1182 it went under Florentine rule. In 1260, after the Battle of Montaperti, Empoli was the seat of a famous council in which Farinata degli Uberti opposed the destruction of Florence. Later Empoli became an important fortress. 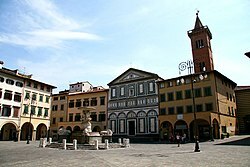 The Piazza Farinata degli Uberti, also known as Piazza dei Leoni ("Lions Square"), in the middle there is a fountain by Luigi Pampaloni (1827). Here lies the Collegiata di Sant'Andrea, the main city's monument. The Palazzo Ghibellino is the former palace of the Guidi counts. It was probably built in the 11th century. The Palazzo Pretorio was the Town Hall in the Middle Ages. In the frazione of Pontorme is the house of the painter Pontormo. Empoli's main football team is Empoli F.C., which is currently playing in Serie B.
Wikimedia Commons has media related to Empoli. This page was last changed on 1 December 2017, at 12:24.